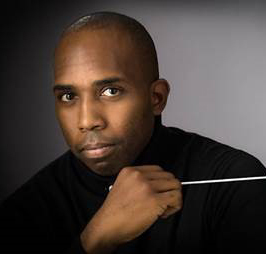 Dr. Gregory Xavier Whitmore is Music Director of Pacific Symphony Orchestra Youth Wind Ensemble. He is also Director of Bands at Mt. San Antonio College (Walnut, CA). These appointments follow a career as Conductor of the College of the Desert Symphony Band (Palm Desert, CA), and Director of Bands at Cathedral City High School (Cathedral City, CA). Whitmore, a native of Ypsilanti, Michigan, received his Bachelor’s Degree in Instrumental Music Education from The University of Michigan School of Music, Theater and Dance in Ann Arbor, Michigan. While a student at The University of Michigan, Whitmore performed in the University of Michigan Bands; and Whitmore led the University of Michigan Marching Band as “Michigan’s Man Up Front”— Drum Major—from 1999 to 2001. Whitmore received his Master's Degree in Music with an emphasis in Wind Conducting from California State University Fullerton studying under Dr. Mitchell Fennell. Whitmore holds a Master's Degree and a Doctorate in Music and Music Education from Columbia University (Teachers College) in the city of New York. Whitmore has conducted ensembles in such notable concert venues as The Musikverein (Vienna), The Wiener Konzerthaus (Vienna), The MuTh (Vienna), Renée and Henry Segerstrom Concert Hall (Costa Mesa), Symphony Hall (Chicago), The Kennedy Center (Washington, D.C.), Carnegie Hall (New York City), Walt Disney Concert Hall (Los Angeles), Meng Hall (Fullerton, California), Holy Trinity Church (Stratford, England), St. John’s Smith Square (London), Chateau Vaux le Vicomte (Paris), and Heidelberg Castle (Germany). Under Whitmore’s direction, the Cathedral City High School Symphony Band was selected to perform as the showcase ensemble during the 2008 California Band Directors Association Annual Convention. Whitmore belongs to several professional organizations that include College Band Directors National Association, Phoenix Honorary Leadership Society, Kappa Kappa Psi Honorary Band Fraternity, Alpha Delta Phi Fraternity, Phi Mu Alpha Sinfonia Fraternity, Pi Kappa Lambda Honor Society, The National Association For Music Education, Southern California School Band And Orchestra Association, and California Music Educators Association.